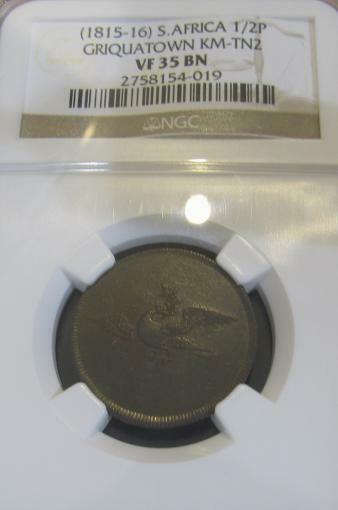 One keeps seeing the early - before 1820 - Griquatown coins appearing for auction. These are mostly the 1/4 and 1/2 copper denominations, rarely 5 and 10 in silver - and one wonders how anyone can dispute that these were the first South African coins. Many of these coins show clear signs of usage, being worn down and/or having holes drilled in them for easier carriage. John Campbell's publication in 1815, "Travels in South Africa, undertaken at the request of the Missionary Society" wrote of the Griquas : "It was likewise resolved, that as they had no circulating medium amongst them, by which they could purchase any small article such as knives, scissors, clothes etc.,supposing as shop to be established amongst them, which they are anxious that there could be, they should apply to the Missionary Society to get silver pieces of different value coined for them. lt is probable that, if this was adopted, in a short time they would circulate among all nations round about and be a great convenience." The point is that the London Missionary Society (LMS) had to have been proactive in having these coins minted and I am convinced that the archives of the LMS in London - although difficult to access if one lives in South Africa - would show this. This topic has been the subject of prior (and often heated) debate here on numerous occasions. Personally, I don't know what to believe but from the standpoint of collecting, what is actually true is secondary to what most collectors and especially those who own and are in the market for these coins (or tokens) actually believe. To a great extent, because these pieces are included in the Hern catalog, the "establishment" position is that they are part of the South African series and this is how they are treated and priced. For those who dispute the "establishment" position (and we know who the leading opponent is), I agree numerous tokens also circulated; maybe more widely and longer. This still doesn't mean they should be considered South African coins and therefore, sell for a lot more. It isn't unusual for tokens to function as defacto coinage and where this existed, the overwhelming percentage (maybe all) are still not included in the coinage series. As an example, "Hard Times" tokens from the depression of the 1830's and early 1840's and Civil War tokens (1861-1865) from the United States which easily circulated as widely and probably as long as any from South Africa. Karel Schoeman (https://en.wikipedia.org/wiki/Karel_Schoeman) in his book about the Griqua Missionaries quoted an extract from the London Missionary Society. It is a resolution where it was unequivocally stated that when the tokens were issued to the locals, the exchange rate was wrongly calculated and that the locals got the tokens for too a cheap rate. So the tokens were issued to the local population there is 100% proof of this. How long did the tokens circulate? Until the day the Church made their sums and saw that their exchange rate favoured the locals (and not them the Church). How long was the time period before the Church recalled the tokens? If their headquarters was in London, England and the mission is in Africa and you have to give the order to stop issuing tokens (or recall them) in the early 1800s, how long do you think it will take? A boat trip hither and thither to England in those days took a while I would think. It couldn't have been a very successful recall as there seem to be quite a few silver GQT coins surviving to this day, even more so for the copper GQT coins as the intrinsic value of the metal was far less than the silver used in the "5" and "10" coins. If the coinage you listed was issued for this purpose, I doubt it was very successful and see no reason to believe why anyone would expect it, either then or now.. I'm not familiar with any aspects of the LMS or GQT but would be very surprised if anyone of importance ever considered it anything remotely approaching a country. From what I know, it was a political non-entity and an economic backwater. On the ZAR coinage, I have read contemporary accounts of this period (written by British authors admittedly) of the war and the period leading up to it. Nothing I have read indicated that the ZAR had diplomatic relations with any other country, not even Germany who I understand supported their cause. I also don't know whether ZAR coinage circulated outside of the ZAR, Orange Free State and Cape Colony. I can see the gold coinage doing so somewhat. The silver and bronze, not at all or irrelevant. 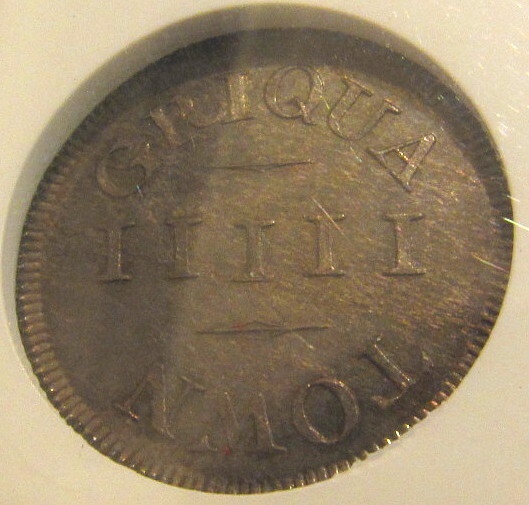 This CQT coinage, maybe a minimal number in Britain knew about it but that is all. Checking on past posts, I see that the Griquatown silver pieces being issued at too a cheap rate was mentioned by the resident Griquatown missionary H Helm in a letter written to Dr John Philip in Cape Town on 21 June 1821. Sorry for my mistake about the source. I was just thinking – why did he only say “silver pieces” and not also mention the copper pieces? So ONLY the silver pieces were issued at the wrong rate – the copper tokens were fine – no one seems to have any problem with them. Thanks for putting this argument to bed with the above references. 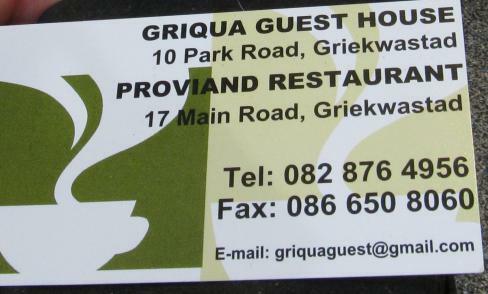 I actually went to Griquatown two years ago on my way to Kimberley and Kalahari. There is a very homely Restaurant situated on the Main road through the town that also sells Schoeman's Book- lovely Rose garden . The Griqua Museum is diagonally across the road from that restaurant but is only open on weekdays (I passed through on a weekend). I obviously bought the book which details the diary entries of Campbell and other missionaries who ministered to the Griqua people there- very interesting reading.A call card was taken and anybody interested in getting a copy can contact the owner of that restaurant/B&B. Please see pics. 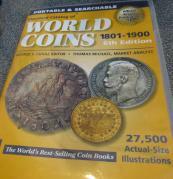 There are four direct references to coins in that book that have been referred to above except for one where on page 104 as part of Reverend John Campbell's private diary with entries on his second visit in 1820 quote: "conversed also on the coin. They said if it would pass sic (be accepted) in the colony , the Griquas would readily take it . I promised to apply to the Governor to sanction its passing in the districts of Graaf-Reynet and Beaufort"
Were Graaf-Reinet and Beaufort separate districts from the district where the mission was stationed? The mission at Griquatown/Klaarwater was beyond the Orange River in Transorangia and was thus technically not part of the Cape Colony. However, this did not stop successive governors during the early 1800's from trying to exert their influence over Transorangia. On the other hand, Graaff-Reinet was definitely part of the Cape Colony and is shown on a map dated 1795 to be one of the four districts of the soon-to-be former Dutch colony - the others being the Cape, Stellenbosch and Swellendam. "Beaufort" is most likely to be a reference to Fort Beaufort in the Eastern Cape, where the London Missionary Society had established a mission station in 1816 and close to which Fort Willshire was built. On the 20th July 1821 Sir Rufane Donkin issued a proclamation of periodical fairs to be held at Fort Wilshire - where trading was to be officially permitted between the Xhosa from across the Keiskamma River - which territory was not part of the Cape Colony - and traders between sunrise and sunset on certain days (initially annually, then quarterly, then monthly and finally weekly). Now......somewhere in my readings I read that "fairs" were also held in Graaff-Reinet - so it does make sense that the Reverend John Campbell would be keen to see his new coinage officially recognised by the Governor so that such coinage could be used at these trading fairs. BTW, Geejay, those are lovely coins which you have provided pictures of! Hi Pierre Henri, Whatever other numismatists' viewpoints or even reasons for those viewpoints are re the GQT coinage being/not being South Africa's first indigenous currency, I think one has to respect those viewpoints. Plus, there has been an enormous amount of research into both the GQT coinage and the Strachan tokens - particularly by the person mentioned - which has added a great deal to our numismatic knowledge. I sincerely doubt whether it was "all about economics", but I do think that the mainstream of South African numismatists decidedly reject the opinion that the GQT coinage was not South Africa's first indigenous coinage. Well I actually do not believe that the Griqua tokens were SA's first indigenous coinage. This is how I saw it and posted it here. 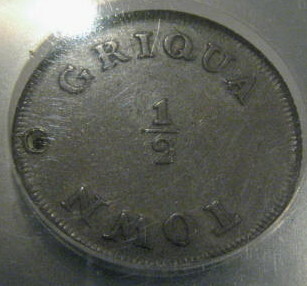 The Griqua Tokens were the first token range minted for SA but probably saw limited circulation in geographical terms. The Paul Kruger Z.A.R. issues of 1892 were the first true coin range in SA that saw widespread acceptance as a national coinage. Well put and this is the reason why this forum serves the numismatic community - so we can all learn. 1. I have no interest in paper currency, so until a few minutes ago I had never heard of the Plettenberg Bank Notes of 1782. Googling it, one comes up with the South African Reserve Bank website, where under "History of South African banknotes 1782 to 1920" it is stated: "In 1782, the Dutch Governor Van Plettenberg was obliged to introduce, for the first time in the history of the Cape, paper money, owing to his inability to procure from the Netherlands a sufficient quantity of coinage for the requirements of the settlement. This earliest paper money was issued in rixdollar and stiver denominations, the currency of the Cape at that time. Based on the above, you are undoubtably correct in asserting that this was the very first [indigenous] currency that circulated in South Africa, although my discussion was supposed to be focussing on coinage; my mistake that I didn't pick out the word "currency" later on.Out of interest, do any of these notes still exist? 2. Re the De Mist Scheepjes Guldens, these were minted by the Batavian Republic (1795 -1806; the formerly VOC/now Dutch authorities in Batavia/Java/Indonesia were pro-French) for circulation in the Netherland East Indies. They were introduced to the Cape by Commissioner-General de Mist. 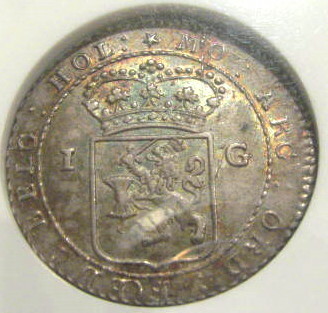 However, as they were not minted specifically only for South Africa/the Cape and would have circulated much more in Batavia/Java/Dutch East Indies, I feel that that the honour of being South Africa's first indigenous coin doesn't ring quite so well as they would have circulated in much the same way as Spanish dollars, Portuguese pecas, etc. To me, South Africa's first indigenous coin would have to be a coin minted for use only in what constitutes modern day South Africa. 3. The GQT coins were minted for use in the nascent Transorangia. Governor Charles Somerset (1814-1826) and acting governor Sir Rufane Donkin (1820-1821) viewed Griquatown and the activities of the missionaries both there and yonder as a nation-building exercise, ie. activities were taking place northwards of the Orange River which were strictly speaking beyond these Governors' authority of the Cape of Good Hope. To me, the fact that Anderson in1820 "promised to apply to the Governor to sanction its [the GQT coinage] passing in the districts of Graaf-Reynet and Beaufort" is proof that Anderson was seeking to make the GQT coins acceptable in the Cape Colony as legal tender. (Question: did he make this approach? Would such a man not keep his promises? And if he did make an approach, there would surely be a record of this in the records of Sir Rufane Donkin ?). I'm not too sure how limited the extent of use of the GQT coins would have been. Transorangia was a huge area and the GQT coins which have pitched up show a great deal or wear and tear. I am leaving this here for the moment. Yes, but they are very rare. In an article written by RF Kennedy in 1973 regarding South African Paper Money, "Very few of these notes survived; there are three in the Africana museum and examples can be seen at the South African Museum and the Cape archives". 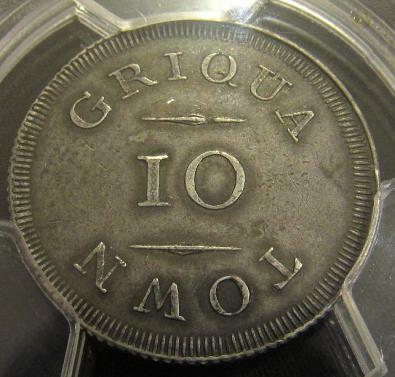 Regarding the Griqua coinage - I have read so many stories of only one token ever being found in South Africa - the one being picked up in Beaufort West. Many years ago, I purchased a large hoard of coins from Natalie Jaffe (City Coins). They were all copper coins and 99% were old VOC doits and British Coppers (George III, William IV and George IV Farthings, Half and Full Pennies - the typical coinage of the early 1800s found in South Africa) They were sold by an old Capetownian family and I bought them via Natalie. There were hundreds of them some very worn. Guess what? One was a Griqua copper quarter penny. Funny that you started this post now. The SA mint will actually launch the new circulation R5 this coming week. 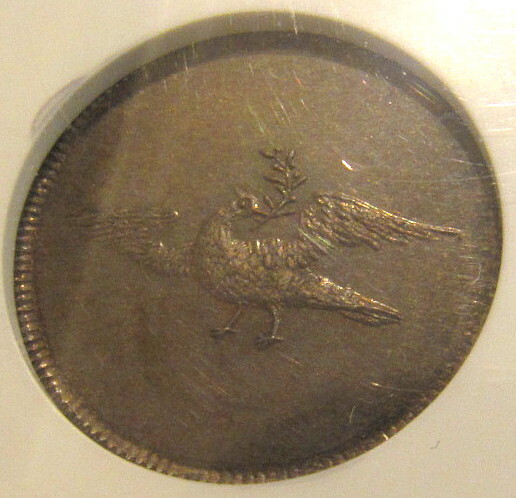 The design will feature the Griquatown dove on it, commemorating 200 years since the mintage of these coins. I am not attending this event on Tuesday, but will post photos of the coins once I get them. I also include a 10 pence from this series in my collection. Thats really good news for the people of South Africa to be made aware of the existence of the Griqua coinage. The Mandela theme is wearing thin as is the interest of the jaded public. Up until now, only real numismatists have been aware of the Griqua coinage and their relevance. Pierre-Henri wrote: " Regarding the Griqua coinage - I have read so many stories of only one token ever being found in South Africa - the one being picked up in Beaufort West. Many years ago, I purchased a large hoard of coins from Natalie Jaffe (City Coins). They were all copper coins and 99% were old VOC doits and British Coppers (George III, William IV and George IV Farthings, Half and Full Pennies -– the typical coinage of the early 1800s found in South Africa) They were sold by an old Capetownian family and I bought them via Natalie. There were hundreds of them – some very worn. Guess what? One was a Griqua copper quarter penny." A few years back a good friend of mine in Uitenhage also was lucky enough to become the owner of a silver 10 pence GQT. It was found together with about six other very old silver coins - all dating before 1825 - in a hidden compartment at the back of a very old wooden and dilapidated cupboard. One wishes that it was possible for this coin to speak as, with the strong ties between the LMS mission station at Bethelsdorp, Port Elizabeth, there could well have been an immediate connection with Anderson, who visited this mission station more than once. Referring back to Pierre-Henri's quote above, to me it is remarkable that so many of these GQT coins - many worn or holed - have survived over the past two centuries. Considering that they were withdrawn from circulation, this makes me believe that these coins had to have circulated over a much wider area than many of us thought. When the decision was taken to withdraw them from circulation, there were already so many of them scattered across Transorangia and the frontiers of the Cape Colony that quite a few - today's survivors - were beyond the reach of the LMS. Re the De Mist Scheepjes Guldens, I am trying to find out more about these coins. De Mist was Commissioner-General for the Cape of Good Hope, Cape Town from 1802 to 1804. 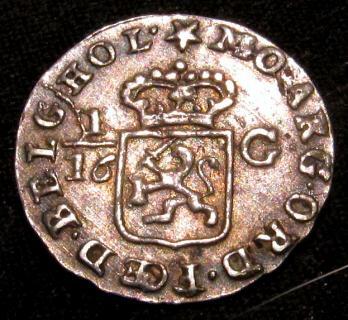 On the same page, Bucknill then refers to other coins that were minted - Doits and Half-Doits - that were "of a new type"; quite different from the Westfrisian VOC coins". 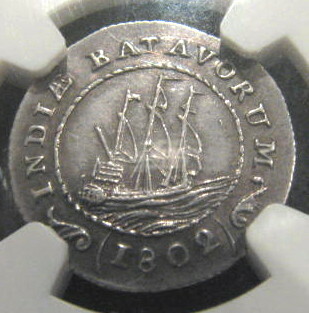 These had the Lion of the Netherlands on the obverse side "with a series of figures representing fractions of a Guilder; on the Reverse the words "INDIAE BATAV(ORUM)" : ie the Indies of the Dutch (Batavians). The Doits and Half-Doits are dated from 1802 to 1809 inclusive: ".
" 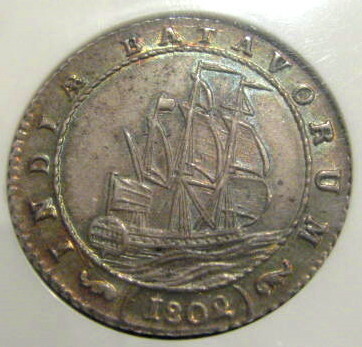 It is very interesting to observe that both these Silver and Copper coins were intended primarily for use in the Netherlands Settlements at the Cape of Good Hope..."
4. the Dutch regained control of the Cape from February 1803 to January 1806, so did they bring a mass of these coins back from the Far East to the Cape? Seems unlikely to me. I have just tried to find the mintage figures for the Scheepjes Guldens in the 4th edition of Krause 1801 - 1900 and...... I have drawn a blank. I cannot find these coins anywhere in my edition of Krause. Do these coins appear in a later edition? Photo of the new R5 coin attached. Although it was the Dutch Commander General De Mist who ordered the coins to be struck and supplied for the Cape of Good Hope, he for some unknown reason, on receiving the money chests, forward them to the East (85 024 Gulden in total). Later he ordered more (half a million Gulden) but only 14 976 Gulden (in denominations of ½, ¼, 1/8 and 1/16) arrived at the Cape. Again, these coins were not put into circulation but were stored at the Castle. t was only after England took the Cape of Good Hope for the second time, that Gen. Maj. David Baird decided to put these coins in circulation in 1806. The one-guldens and coppers were thus never intentionally put into circulation for the Cape - only the ½, ¼, 1/8 and 1/16 silver Gulden-fractions worth a total of 14 976 Guldens. One can only guess how many coins this were, but I would guess around 100 000 coins. In the Krause 4th Edition which I also have the Batavian Republic coinage misses out the whole Scheepjesgulden group unfortunately but the 6th Edition from 2010 which I have in CD format include a section on them and actually has a Pic of what looks to me to be one of the fractions on the CD cover (pleae see pic). There are no mintages of any of them listed though so they are presumed unknown . In 1927, H. Alexander Parsons published his The Coinage of Griqualand. This publication has been vilified by Scott Balson by the saying that all the current misinformation we have about the Griqua currency is based on this flawed booklet. Was anything written before 1927 on the Griqua coinage? Yes indeed; in the old annals of the Transvaal Museum, one will find an article written in 1910 on the Griqua coinage. The author was Dr J.W.B. Gunning, the director of the Transvaal Museum from 1893 to 1913. He starts the article by saying that in 1892 whilst being in the Orange Free State (he practised as a medical doctor there); he came into possession of three Griqua coins being the Five Pence, Half Penny and Quarter Penny pieces. He says these Griqua coins were first mentioned by the Reverent Campbell on his first visit to the Griqua Mission in the early 1800s. Dr Gunning wrote an enquiring letter to Dr Ralph Wardlaw Thompson who was a director of the London Missionary Society from 1874 to1880 and their foreign secretary from 1881 onwards. Dr Gunning then mentions a second source regarding the Griqua coinage, that being H.J Hofstede who wrote the first history book on the Orange Free State in 1876 (Geschiedenis van de Oranje Vrijstaat). On page 89 of the book he states that zilveren en koperen stukken gelds (silver and copper coin pieces) were issued by the London Missionary Society to the Griquas after Dr John Campbells visit the mission in the early 1800s. 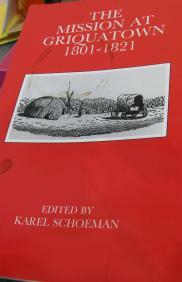 The information and sources Dr Gunning provides, all predates Parsons booklet on the Griqua coinage. Parsons work was published many years after Gunnings death in 1913.